Glenda Gentry (right) and Candy Crocker (left) in attendance at the Bud McCall open house. Both said they have known Mr. McCall forever. Ms. Crocker lived next to Mr. McCall in Fernwood. "He was one of the best neighbors you could ask for," she said. Ms. Gentry worked Mr. McCall's wife Janice McCall at the St. Joe Valley Clinic. Velda and Dave Ausman (not pictured) attended the open house for Bud McCall at the courthouse Friday. The Ausmans said they have known Mr. McCall for 30 years. 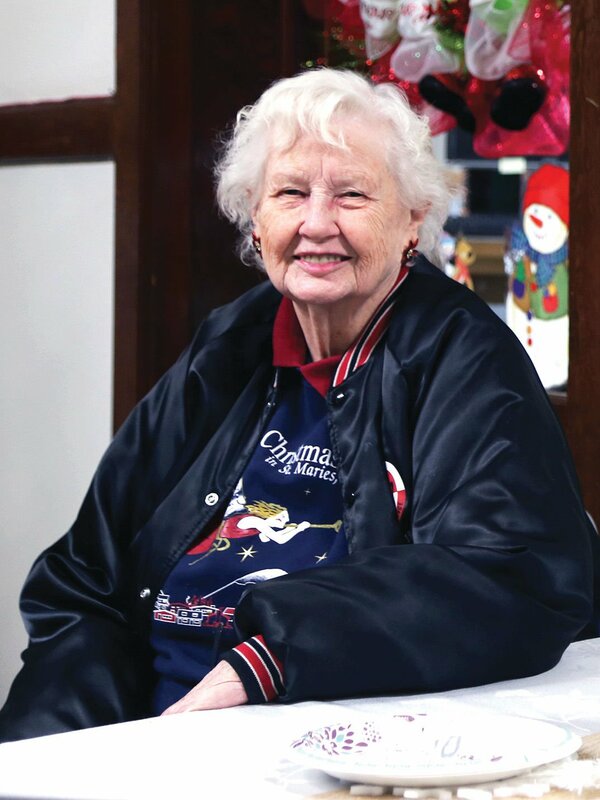 "He helped build the Senior Center," Ms. Ausman said. County Commissioner Jack Buell sits with Commissioner Bud McCall at the open house recognizing Mr. McCall for his 42 years of service. Mr. Buell and Mr. McCall met their freshmen year of high school. They have worked together as commissioners for the entirety of Mr. McCall's tenure. "I love this guy, and I've cherished working with him," Mr. Buell said. County Clerk Deanne Bramblett (left), Deputy Clerk Lynn Ragan and Deputy Clerk Michelle Siron have all worked with Mr. McCall for over a decade at the courthouse. "He's been a great commissioner and we'll miss working with him and seeing him at the courthouse," Ms. Bramblett said. Arlo Slack, former Idaho Department of Lands fire warden, speaks with Pat McFadden, a former Benewah County Judge at the open house for Bud McCall. "Bud was great to work with and always helped you out if you needed it," Mr. McFadden said. Lauren Edwards and Katrinia Koser chat with teacher Bryan Chase. Mr. Chase organizes the Economic Summit at St. Maries High School. Chance Baird, Braxden Colglazer and Megan Eells. Mikaela Richardson, Audrey Safrit, Ethan Pope and Lauren Edwards. Mikaela Richardson, Kaela Davis, Alyssa Green and Jossie Trujillo of Team Ireland. SMHS students Hannah Harvey (far left), Cade Truscott and Colby Moore talk to bankers Aki Hicks and Jenny Rose. Dillon Kilborn (far left), Lucas Pope and Hannah Harvey discuss strategy with Sierra Ascencio while Darby Osier works with students from Genesee, representing North Korea, at Wednesday's Economic Summit. Jose Quincy checks in at the bank during the SMHS Economic Summit. Locals volunteered to judge and serve as bankers. Volunteers included Jenny Rose, Aki Hicks, Tom Ebert and Sheena Weaver. Gwen Thurman and Cami Nelson listen to final instruction from Bryan Chase prior to the start of Wednesday's Economic Summit at St. Maries High School. Rileigh Gray, left, and Darby Osier prepare their team's strategy prior to the start of the Economic Summit at St. Maries High School last week. Economic Summit judge Kaisie Brede hands a packet to a Genessee student while SMHS student Alyssa Geldreich, far right, picks up her team's packet from another judge. Angela Pomerinke and her son Patrick Pomerinke fill bags with candy to be placed in Christmas baskets, organized by the Elks Lodge, for families in need. Beverly Wilson (left) and Terry Murray (right) work back-to-back filling boxes with food stuffs as a part of the Elks Lodge Christmas basket donation effort. Benewah Community Hospital CEO Liz Sellers wraps gifts at the Elks Lodge Saturday morning. The gifts will be placed in Christmas baskets donated to families in need by the Elks Lodge. St. Maries High School student and Boy Scout, David Scott puts cans of chili in boxes to be donated to families in need this holiday season as part of the Elks Lodge Christmas basket drive. Haylee Waddell was a member of the Flag Girl Team for the National Finals Rodeo in Las Vegas. Haylee Waddell carried the flag for Pendleton Whisky during the 10 days she rode as a member of the National Finals Rodeo Flag Girl Team. Ms. Waddell grew up competing in area horse events. This shot shows the members of the Flag Girl Team who rode at the 2018 National Finals Rodeo. Maggie Chatigny and Mason Pugh play with an antique flip book brought by the Hughes House. First-grade students got a chance to play with antique toys from the museum's collection during a special event at Heyburn Elementary Dec. 13. Ava Weiker look through an old-fashioned viewmaster as her classmates play with other historical toys. First-grade teacher Emily McMannis talks to her class as Christie Sotin plays with a classic toy. Volunteers from the Hughes House brought antique toys from their museum collection for children to play with Dec. 13. Seen here are Bilee Lindsey, Winnie Chatigny, Victoria Gauthier and Ellie Shuman. Gage Ooyman tries out a classic typewriter in his first-grade class Dec. 13. The machine was one of many toys brought by the Hughes House for children to learn about and play with. Attendees gathered for the Tree of Memories ceremony Friday evening at the Benewah County Courthouse. The ceremony allows those who have lost loved ones to come together and remember them during the holidays. Names of the individuals honored are announced at the annual event. A complete list of people honored will appear in the December 26th print edition. Volunteers Sally Grant (left), Ray Williams, Shirley Williams, Beverly McCuaig, Bonnie Arrhenius and MaryAnne Wheeler will help create Christmas Dinner at the Community Presbyterian Church, Dec. 25. Nancy Harrison (left) and Pastor Dale Harrison of the First Baptist Church on Second Street will host the church's inaugural Christmas Day dinner this year. Barbara McRight (left), Charlene Vaughan, Wilma Barnes, Virginia Cochrane (middle), Barbara Hult (right), manager Athena Scull (back), and assistant manager Rhonda Martinell comprise the Valley Vista Cut Ups. The group is busy working to create the largest rubberband ball in Idaho, and making comfort pillows to give to Benewah Community Hospital. BreAnna George and Haidyn Osterson decorate their glass ornaments with paint. Zoey Osterson and Mykenna George concentrate on painting their ornaments. Desmond Naccarato helps Ren Bohannon paint. Santa watches the children as they make ornaments for their trees. John Bohannon and son, Ren Bohannon, enjoy breakfast with Santa. Jaxon Lewis checks out Santa's beard. Skip Harwood (left), Bill Cowin, Kay Cowin attended the open house held to recognize County Commissioner Bud McCall for 42 years of service Friday at the County Courthouse. Mr. Harwood attended grade school in Fernwood with Mr. McCall.